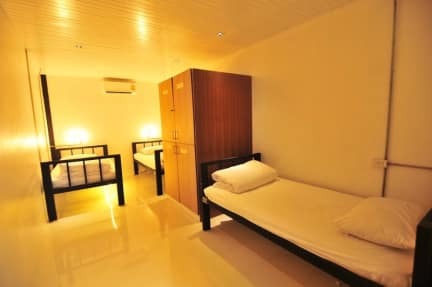 Freedom Hostels@Phi Phi i Koh Phi Phi, Thailand: Reservér nu! Didn't like this hostel at all. It's new and pretty big, but it mostly reminded me of a prison. The staff was not friendly at all. Didn't so much as look at us when we came down from our room and seemed hostile in general. There is only four bathrooms/toilets, which were pretty filthy. There was a line all the time to just go to the toilet. Not cool. The common area is a stack of white (dirty) leather matresses on the floor and that was it. No social atmosphere. Wouldn't go there again.